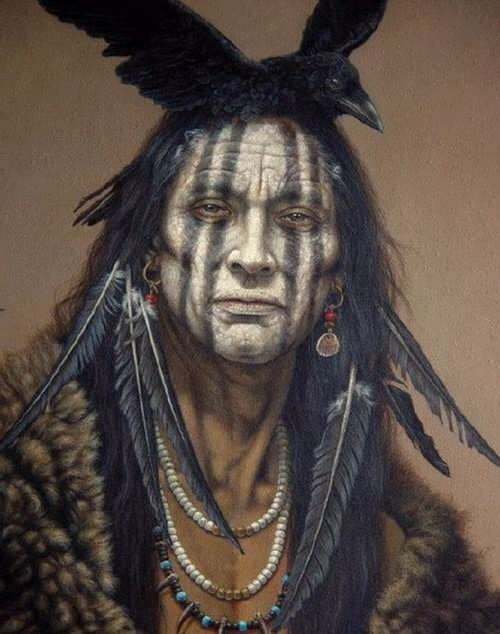 A long time ago there lived a Cherokee boy named Sequoyah. He was not as tall as his friends, and he was lame. Yet this small boy grew up to be the greatest Cherokee of them all. For it was Sequoyah who solved the mystery of the talking leaves. Sequoyah was born about 1773. No one knows for sure just which year it was. In those days the Indians did not have a written language. Sequoyah’s mother was the daughter of a great Cherokee chief. His father was a white man named Nathaniel Gist. Nathaniel left the Cherokees soon after Sequoyah was born. He had to go back to his own people. But Sequoyah and his mother stayed with the tribe. That was the custom. When Sequoyah grew up, he got interested in the white people’s language. The white people used paper for writing. Sequoyah thought that paper looked like large white leaves. The “leaves”: were covered with many black marks. Sequoyah watched the people as they looked at their “leaves”. To Sequoyah it seemed as though the little marks written on the paper were talking to people. Sequoyah never forgot the mystery of the talking leaves. 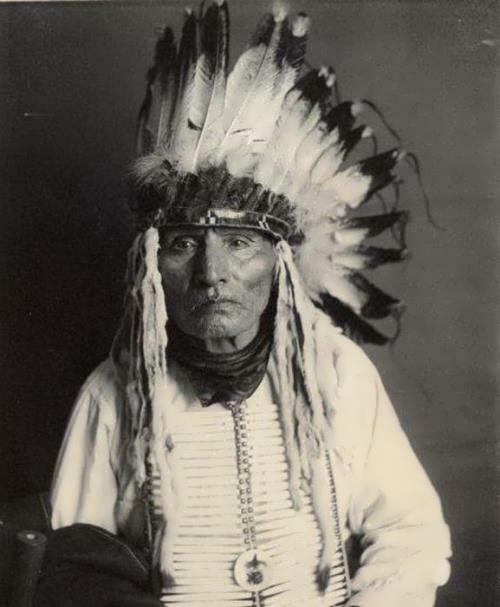 He made up his mind that if leaves could talk, then he would make them talk for the Cherokee people. Sequoyah tried to make a picture for every word he could think of. He made the signs on pieces of bark. He made picture signs for horses and pots and every other thing he knew. In a very short time, he had so many signs that no one could remember them all. Even Sequoyah was getting mixed up. I here had to be a better way. Sequoyah thought and thought, and then one day the idea came. Of course! All words are made up of sounds. He didn’t need a sign for every word but only one for every sound. By putting the sounds together, he could make any word. Sequoyah set to work right away to find out how many sounds there were in the Cherokee language. His friends began to look at him strangely. Sequoyah worked night and day. He didn’t care about anything else. At last the work was finished. 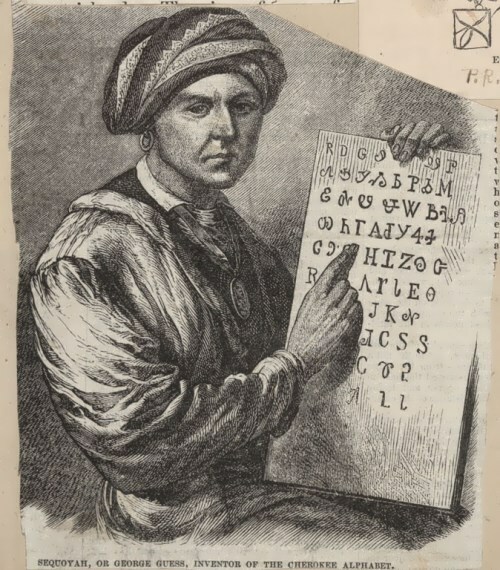 Sequoyah taught his daughter, Ah-yoka, to read and write his language. But what about the others? Would they care? 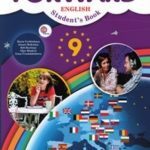 Would they want to learn? Sequoyah thought the time had come to find out if all the years of hard work had been worth it. It was 1821, and it was time to make a test. Sequoyah went to the head of the Cherokee tribe, and a meeting was called. Word of Sequoyah’s talking leaves went through the tribe. The meeting room was soon filled with excited people. Sequoyah was sent out of the room with two guards. They made sure that Sequoyah could not hear what was happening in the room. Inside, the chiefs gave messages to Sequoyah’s daughter, Ah-yoka. Nothing could be heard in the room but Ah-yoka’s quill pen as she quickly began writing messages. At last Sequoyah was called back into the room. He took the paper from his daughter’s hand and read the messages in a clear, loud voice. It worked! The Cherokee people had a written language. Now everyone wanted to learn it. Of course, everyone was proud of Sequoyah. Never before had just one man made up a written language by himself. Today, the tallest trees in the world are called sequoias. They are named after the small lame boy who became the greatest Cherokee of them all — the man who brought a great gift to his people — the written word.